Car Quids | Why Choose Car Quids? Moving Media - How to choose? You might have noticed, or you maybe you haven’t, but there’s a lot more advertising about. It’s filling your Facebook feed, it’s on phone boxes, it’s even starting to appear on the back of airplane seats. Advertising is pretty much everywhere. That means that it’s becoming more difficult to differentiate your brand from the competition - but our targeted moving media is a clear way to stand out. Car Quids isn’t the only show in town for this. If your brand needs a presence in London city centre, then taxi advertising might be worth considering, and bus advertising can be a useful way to get in front of pedestrians in local areas as well. 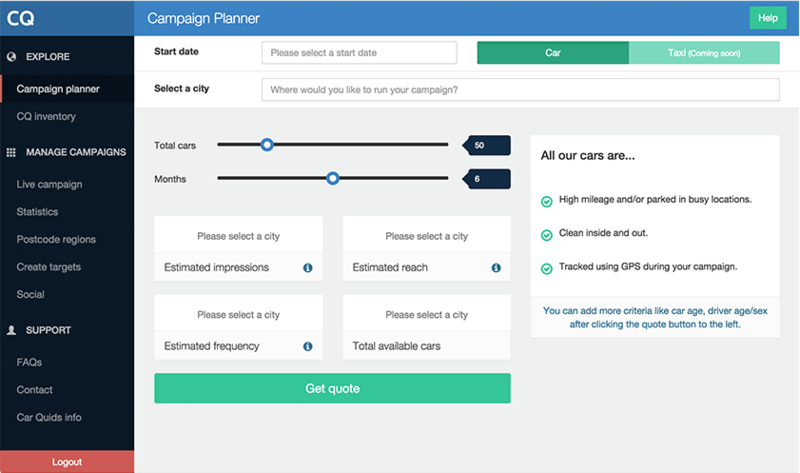 One thing that you can be sure of if you book a campaign on Car Quids, is that the drivers’ cars won’t be ‘bangers’. All cars are 2009 or newer, and checked to ensure they are kept clean throughout the campaign - the drivers send us photos of their cars on a monthly basis before they are paid. Without a doubt, we’ve had some great adverts on the campaigns that we run, but what really helps you stand out is that you will have a team of drivers spreading your message. For Just Park, our drivers became ambassadors handing out vouchers promoting Just Park in return for free parking credit. Pizza Hut Delivery ran a campaign where ambassadors posted to their social networks increasing the brand influence and positive sentiment in the community. The cars left a lasting impression in the community, and helped us ramp up our social media exposure in the area. At Car Quids we have a network of over 15,000 drivers to pick from, and we’re expanding rapidly. When we run a brand campaign, we carefully pick the drivers you need based on their location and demographics. For example, PensionBee specifically picked drivers aged over 32 in Brighton when expanding their pension app. Would you like to get your brand across nationwide or in a certain part of the city in a highly targeted manner? Contact omar@carquids.com - we’d be delighted to help.